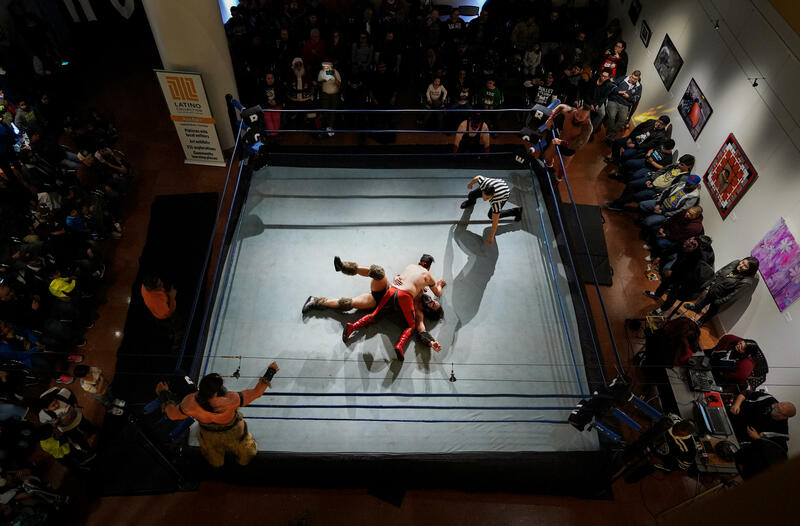 Wrestlers compete during a River City Wrestling event, Friday, Dec. 14, 2018, at the central library in San Antonio. The ¡Lucha Libros! event was produced by River City Wrestling, which also puts on American-style wrestling matches around the city. 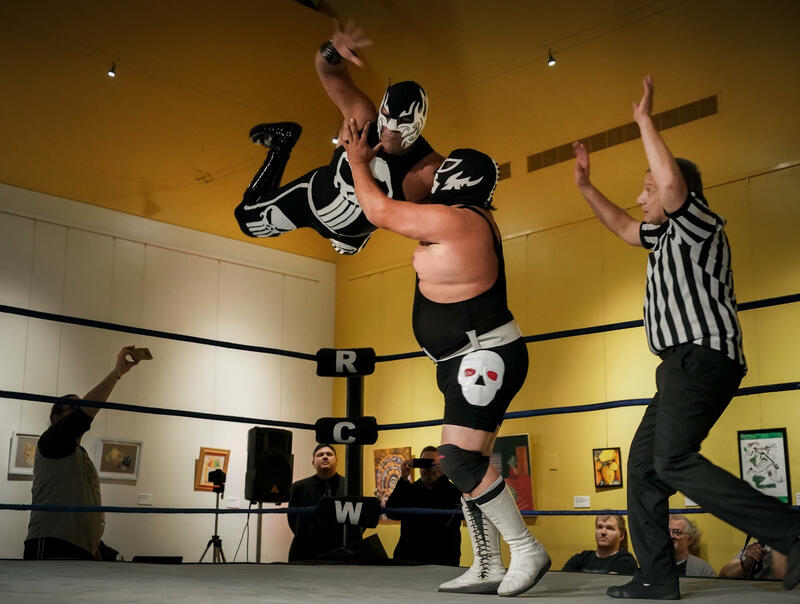 RCW manager Brandon Oliver said lucha libre — roughly translated to “freestyle wrestling” — is like a family tradition in San Antonio. Oliver said usually about 500 people turn out for most of the local lucha libre matches he puts together. He estimated there are about 30 dedicated luchadores in San Antonio. Oliver said venues vary in size, depending on available space. The El Luchador bar in Southtown, decorated with masks and wrestling posters, sometimes hosts matches in its parking lot. Wrestling merchandise is just as popular as the wrestling itself. 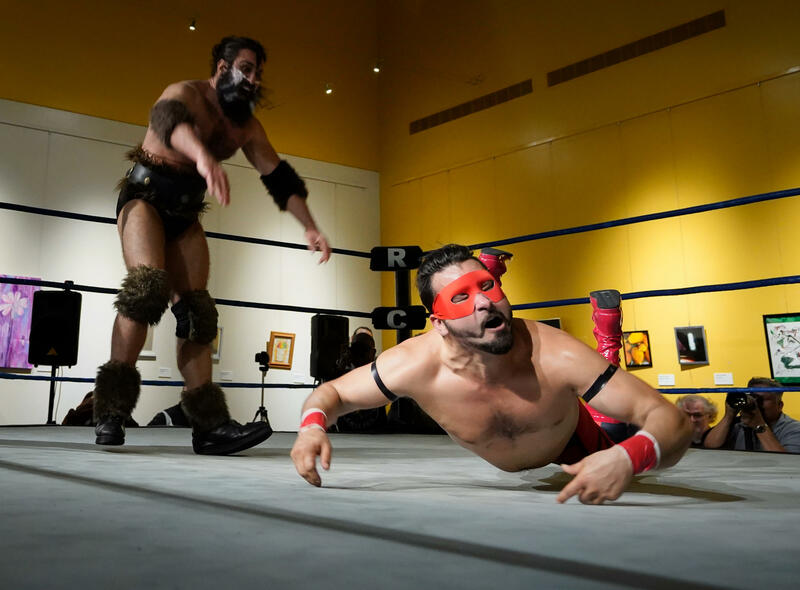 Wrestlers compete during a River City Wrestling event at the central library in San Antonio. Oscar Zamarron sells lucha libre masks and other wrestling merchandise at the Wonderland of the Americas Mall, near Interstate 410 and Fredericksburg Road. Zamarron, a wrestler himself and ring announcer, is also a lucha libre history buff. Like Oliver, he said, the sport draws the young and old. “It never fails that you’re gonna see someone’s grandma out there, wanting to get into the ring and just verbally dismember somebody who is competing in the ring,” he said. 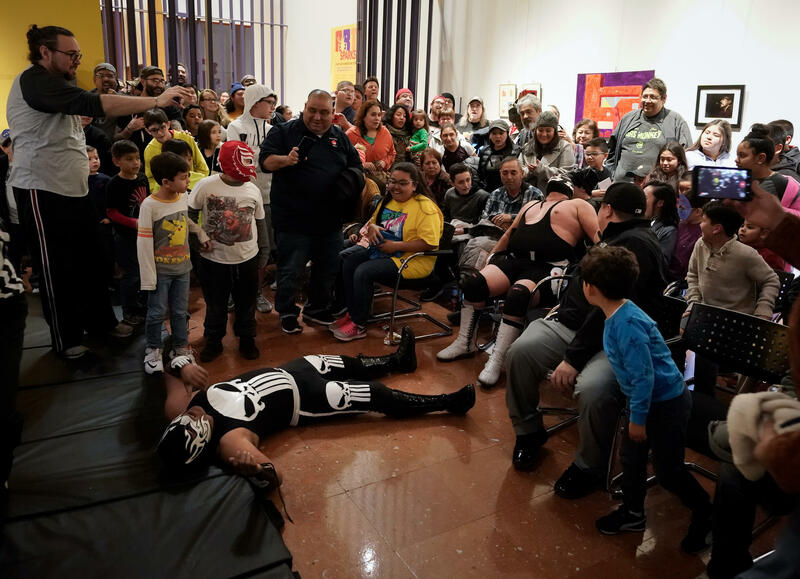 “Technicos are usually the ones obeying the rules, following the rules, but the rudos are the ones that are gonna do whatever it takes to keep their masks and protect their identity,” Zamarron said. Zamarron says the luchadores wear the masks with a strong sense of honor. He said if they agree to wager their masks before a match, the loser may be forced give up this identity forever. He said a famous wrestler in Mexico once known as Psychosis is a good example. Many luchadores, however, will never publicly reveal their faces, real names, or even day jobs. Zamarron said one of Mexico’s most famous luchadores El Santo, or The Saint, is an extreme example of that tradition. Back at the library, the wrestling warriors glared at each other as the crowd cheered. Children watched the action with fascination. Dr. Maldad, or Dr. Evil, faced down Baby Black. Both wore black and white skull masks, but Dr. Maldad lived up to his name. He slammed his body into his adversary, jumped onto his chest, and twisted his arms and legs. The crowd jeered, and the referee tried to keep order. Dr. Maldad suddenly turned on him and took him down too. The shocked referee almost rolled out of the ring. Some in the crowd were outraged, while others laughed. Speaking through translator Chayo Rodriguez, who is a fellow wrestler, Dr. Maldad said the colorful and fierce-looking masks are inspired by Mexico’s ancient warriors. “What signifies the lucha mask is preparation from the luchador — dedication obviously — but it goes back to the culture of their warrior history, back to the Mayan ages,” the translator said. The opponents in the ring weren’t the only ones snarling at each other. Wrestlers also faced off with members of the rowdy crowd, who didn’t hold back with their own playful insults. The taunts and cheers echoed throughout the darkened library. The colorful trash-talking is another cherished lucha libre tradition. Rodriguez portrays the Crimson Cadet, a character known to destroy other luchadores. He said the successful wrestlers always interact with the fans. Rene Holmes, who was in the crowd, loves lucha libre not just for what it portrays but also for what it symbolizes: the good versus the bad, the flying around in the ring, and the way it represents Mexican culture. A young fan, Evan Pantoja, appreciated the match and the performers. His said his favorite wrestler is Sin Cara, or The One Without a Face, who made a name for himself in the WWE using luchador style. “He’s good. I like him because he has a mask because I like luchadores,” he said. The origins of lucha libre wrestling are not exactly known. According to one story, its roots began El Paso in 1929, when Salvador Lutteroth Gonzalez, a Mexican promoter, watched a match and was inspired to popularize it in Mexico. He is now considered the father of the sport.